With its unglazed, textured finish and its decorative motif, the stylish daltile castle metals 12 in. x 16 in. 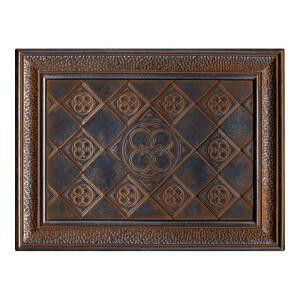 Wrought iron metal clover mural wall tile is a great way to enjoy a traditional, finished appearance in your living space. This tile is constructed from durable, frost-resistant metal and features an impervious water absorption rating that makes it suitable for a wide variety of indoor and outdoor applications. Buy online EXPO Castle Metals 12 in. x 16 in. Wrought Iron Metal Clover Mural Wall Tile CM021216DECO1P, leave review and share Your friends.